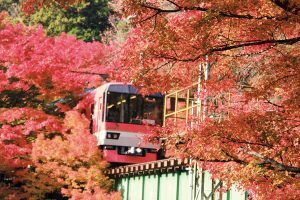 Local train trip around famous autumn foliage sites | Why KYOTO? 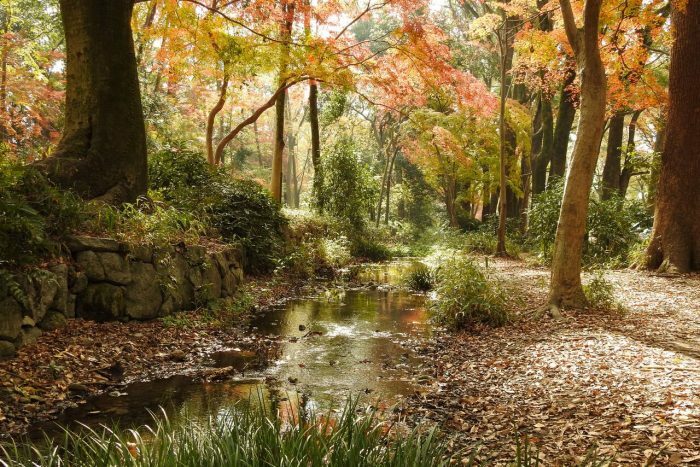 Kyoto is filled with sightseeing locations, so visitors want to see as many as possible in a day. Why not enjoy your travel time? 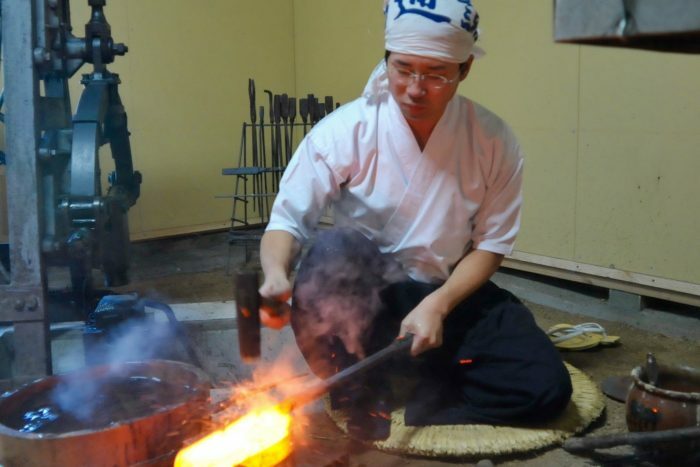 These two large, local lines that the residents of Kyoto love are lots of fun for tourists as well! All aboard this bijoux train car for a scenic tour. Near the KAMO River delta where the KAMO and TAKANO rivers meet, our trip begins at the Demachiyanagi Station on the EIZAN ELECTRIC RAILWAY line. A sign indicates the Eizan line, or green line, to Mount Hiei and the Kurama line, or red line, to Kurama and Kibune. The EIZAN ELECTRIC RAILWAY, known to locals as a beloved mode of transportation for many years, is nicknamed EIDEN. 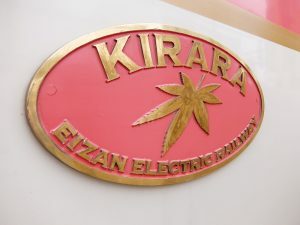 It also has a special train that is hugely popular with tourists, an observation train called Kirara. A large amount of glassed-in areas let visitors fully enjoy the scenery. 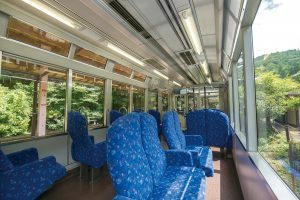 The central eight seats facing the windows are a tremendous feature, and the train runs one to two times per hour. 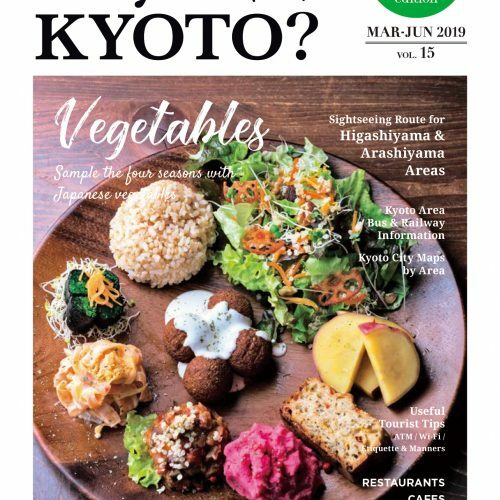 It takes approximately 30 minutes one way from Demachiyanagi Station where you board the Kirara to its last stop at Kurama Station. 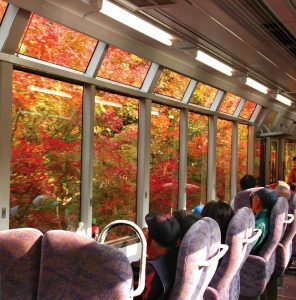 Do not miss the Maple Leaf Tunnel between Ichihara Station and Ninose Station. The time between the leaves starting to change color until they are bright red and orange is short. Viewed from the slow-moving train, the foliage fills your field of vision. Mr. Kotera from the Sales Division also told us about two more places he recommends. “The first is Kibuneguchi Station. As you leave Kurama Station heading to Demachiyanagi Station, first be sure to move to the front of the train. 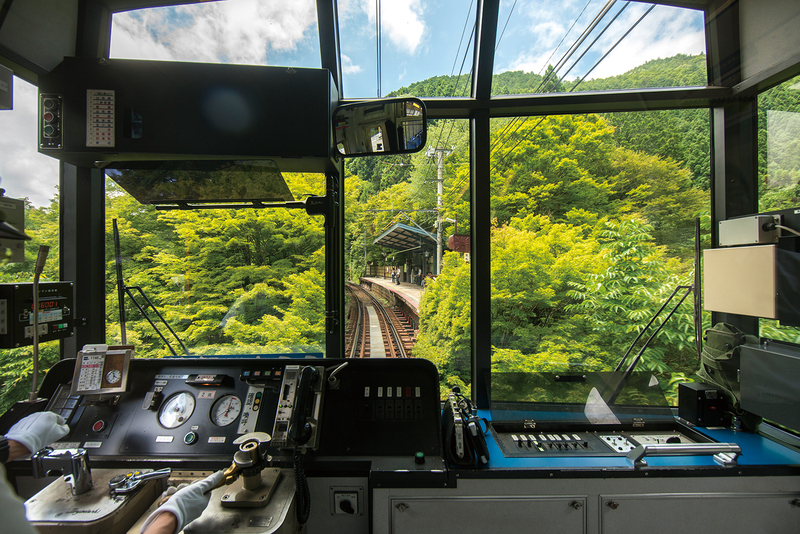 As the train approaches, the sight of Kibuneguchi Station covered in foliage is impressive. Another one is Ninose Station. The sight of the foliage on a large tree standing inside the structure is powerful.” In autumn, the foliage is illuminated from sunset to about 9pm. The lights on the train are turned off as it passes slowly through the crimson Maple Leaf Tunnel, revealing an otherworldly scene. 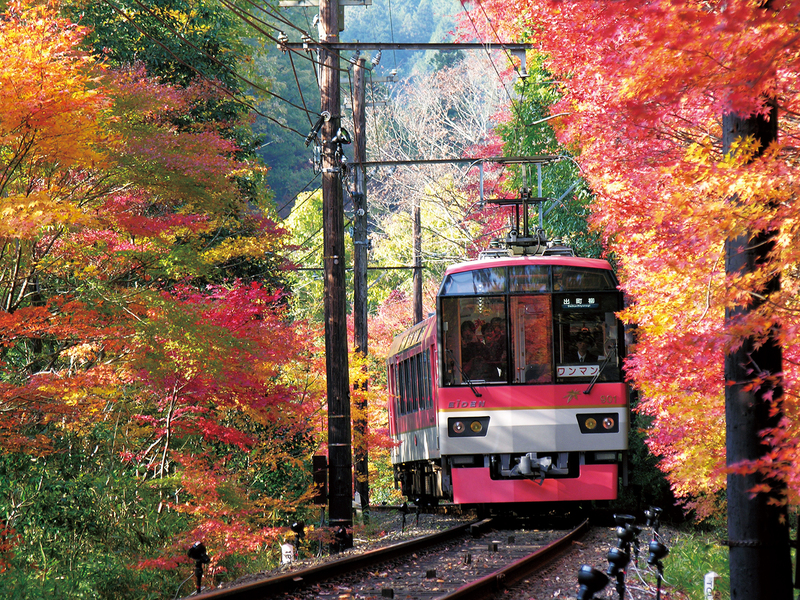 The peak foliage season in Kyoto is generally from the middle to the end of November. Climb aboard the Kirara for a truly special experience. The information is current as of August 2017.